You don't just have to jet-off to Sicily for a long summer holiday; the island is also an ideal destination for a short break. Short breaks to Sicily are particularly rewarding when spent exploring one or more of the island's historic and atmospheric cities, allowing you to get a quick and comprehensive impression of the island's identity. Whatever it is you wish to see or get out of your short break to Sicily, we're ready to help tailor-make perfect short breaks to the island. What is a tailormade holiday? For us, tailormade holidays are all about freedom. Pick what suits you best, enjoy the freedom to select from our finest hotels and our most dazzling properties; embrace the freedom to use your imagination and build the perfect short break in Sicily. Choose a stay in Sicily's capital, Palermo, and enjoy the atmosphere of this fascinating and historic city. Head out on a walking tour and admire the city's two opera house and mesmerising cathedral, and don't forget to try the delicious street food; among the finest on the island. With wonderful accommodation to choose from, such as Hotel Plaza Opera, located in the heart of the city, and Grand Hotel Villa Igiea, adding a touch of 5* luxury to your short break; a trip to Palermo will be effortlessly rewarding. Taormina is one of the most popular holiday destinations on the entire island, and the perfect size to serve as the basis of your short break to Sicily. Take to the charming and authentic streets to soak up the atmosphere of this cultural hub, passing pretty churches and inviting boutiques and eateries. Don't miss out on a visit to The Greek Theatre, as well as the opportunity to take a day trip to see the world-famous and imposing stature of Mount Etna. Luxurious hotels such as The Ashbee and Villa Neri Resort & Spa ​ will ensure that you remain comfortable and indulged throughout your short break. 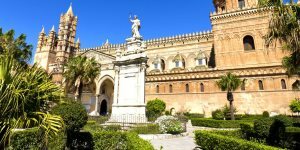 Palermo is an excellent city to absorb yourself into the sights and beautiful and historic buildings with a bit of shopping and cafè culture thrown in. Hotel Plaza Opera is a perfect choice, due to its central position in the city centre and its fantastic views from it’s roof terrace. 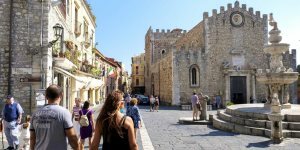 The amazing Sicilian capital offers walks amongst the ancient monuments and the fabulous streets, shops and promenades - a perfect mix of great culture, city life and excellent food. 3 nights B&B in a double room at Hotel Plaza Opera in central Palermo, including flights and private transfers. 3 nights B&B in a double room at The Ashbee near to Taormina, including flights and private transfers. 3 nights B&B in a double room at Grand Hotel Mazzaro Sea Palace, Taormina Mare, including flights and private transfers.